We are solving problems based on work, power and energy. In this post we are more focused regarding work done in different cases. We need to apply force on a body to overcome the inertia of the body. If the applied force is sufficient and applied in proper direction, work is said to be done and we can measure the work done as the dot product of force and displacement. There are two identical blocks moving with same speed of two meter per second towards each other on a horizontal friction less surface. This two blocks collides each other and they stick together and come to rest. We need to measure the work done both by external and internal force. The problem is as shown below. The two blocks are moving towards each other and it is due to internal forces. Thus no external work is done in this case as there is no external force acting on the system. 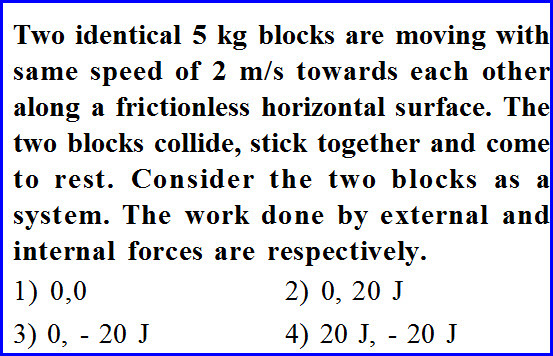 We can use third equation of motion and measure the acceleration of the two bodies together. We can measure the work done due to this internal force using the definition of the work done as shown in the diagram below. 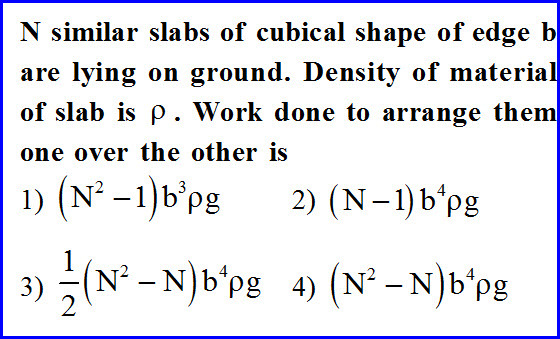 N number of cubical slabs each of side b are lying on the ground and density of the material is given to us. We need to measure the work done in arranging them one over the other. The problem is as shown in the diagram below. Each block is on the ground and it has some dimensions. So with reference to the surface of the earth, it has some potential energy and the total potential energy of the all blocks has to be measured first as shown in the diagram below. To measure potential energy of the block, a point where its mass appears to be concentrated is measured and that point is called center of mass. Center of mass is at geometrical center for a regular shaped body. 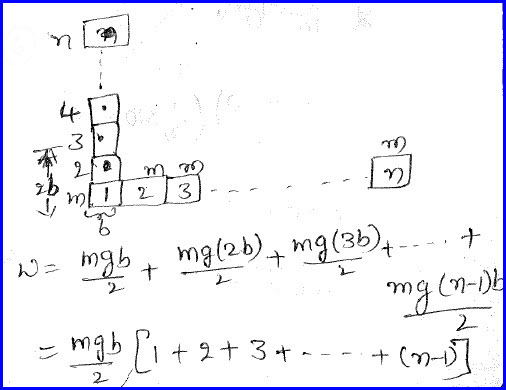 We cab add the sum of all the terms and mass can be written as the product of mass and velocity. Problem is further solved as shown in the diagram below. 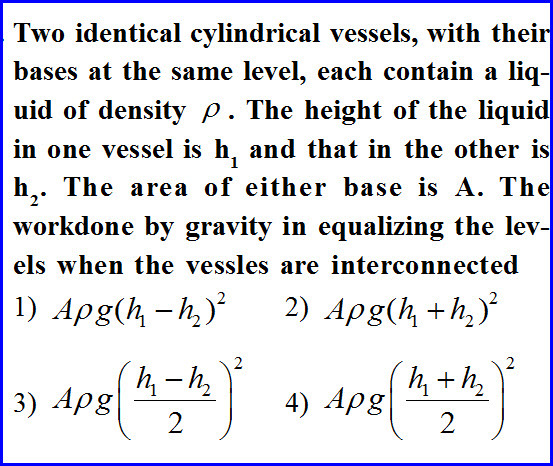 It is given in the problem that there are two identical cylindrical vessels with their base at the same level and both of them are having the same liquid. The liquids in each vessel is at different height and area of cross section of the vessel is given to us. We need to measure the work done by gravitational force in equalizing the levels of the liquid in both the containers. We know that liquid in each vessel is at certain height and hence we need to measure the potential energy of each one separately first. We know that the mass of the liquid is spread over the entire height and hence we need to consider the concept of center of mass where mass appears to be focused on the middle of the height . 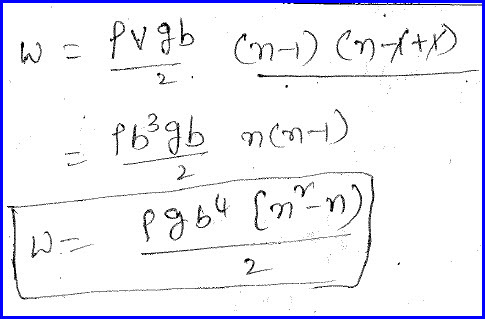 So the work done is difference in potential energies of each case and half is due to center of mass. 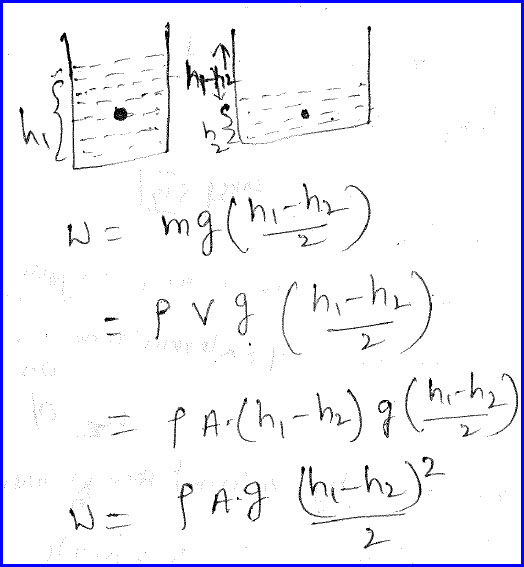 We can further write volume of liquid as the product of area of cross section of the cylinder and height of the liquid. Problem is further solved as shown in the diagram below. 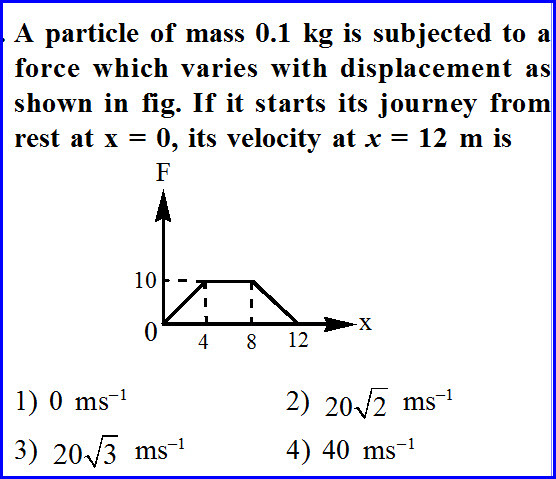 It is given in the problem that a particle of mass 100 gram is subjected to a force and it varies with displacement as shown in the diagram below. 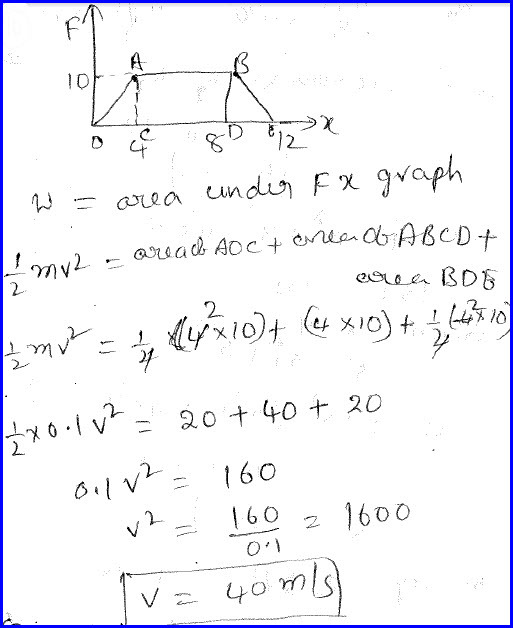 It starts from rest and we need to know the velocity at a displacement of 12 meter. 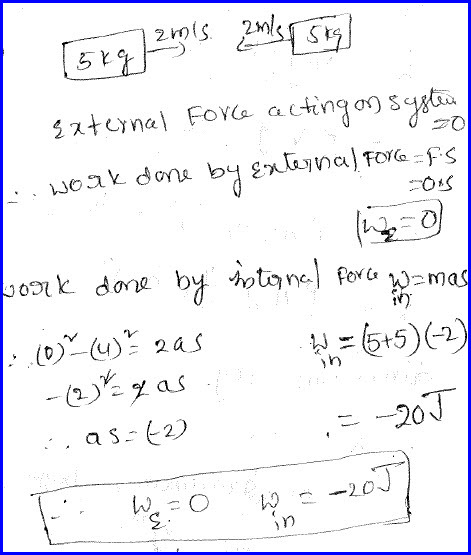 Work done is the area of force and displacement graph. The graph is as shown below. It can be noticed that initially body is at rest and a force is applied on the body so that it is having acceleration. Further for some time there is no force acting and the body continue to move with the velocity that it has acquired. Further reverse force is acting on the body and hence the body has negative acceleration. We can equate the work done that is area of the total graph to the kinetic energy and the problem is solved further as shown in the diagram below.